New Works Festival | Department of Drama, U.Va. Join the Department of Drama this week for The New Works Festival! Three new plays written and produced by faculty-mentored students premiere in the Helms Theatre April 26-28 at 8pm. “These plays were written and developed in Playwriting classes last fall; at the end of the semester the three plays that you’ll see tonight were chosen. Each is unique in terms of subject matter, tone and style, but all display not only talent but fresh and individual voices,” said faculty mentor Dave Dalton. The UVA Department of Drama is proud to present these plays by talented artists at the dawn of their careers. Tickets are free and available through the UVA Arts Box Office. 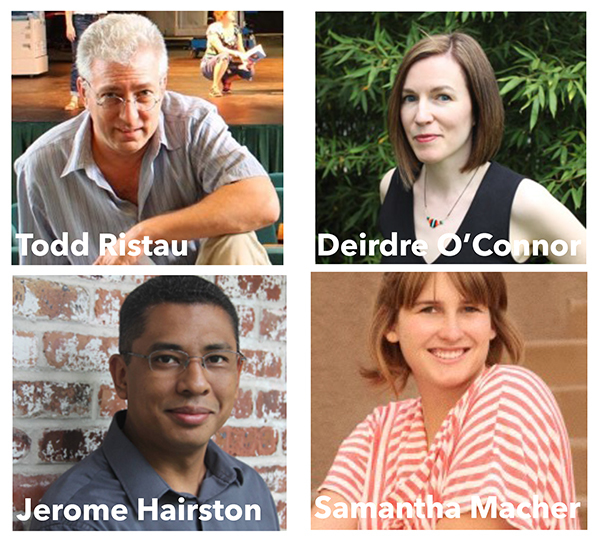 Join the Department of Drama as we welcome four writers for THE WRITING LIFE: an industry Q&A with guest writers Jerome Hairston, Samantha Macher, Deirdre O'Connor, and Todd Ristau on Friday, April 28 from 4:00 - 5:00pm in the Helms Theatre. Jerome Hairston is a playwright and television writer whose work has been developed and produced across the country. His plays include: a.m. Sunday (Humana Festival, Centerstage Baltimore), L’Eboueur Sleeps Tonight, Iqbal (The Children’s Theater Company), Forty Minute Finish (Humana Festival), Method Skin, and Knife on Bone. He has received commissions from The Kennedy Center, The Public Theatre/NYSF, Centerstage Baltimore, The McCarter Theater, The Children’s Theater Company, The Bush Foundation/Guthrie New Play Program, and the Manhattan Theatre Club. He is a recipient of a Heideman Award, a Joyce award, an AATE Distinguished Play Award, and was honored by Beth Henley with a Fellowship of Southern Writers’ Bryan Family Foundation Award for Drama. For television he has written for Law and Order: Criminal Intent, Smash and Deception. He received his BA in Theatre from James Madison University and is a graduate of Columbia University's MFA playwriting program. Samantha Macher is a playwright and filmmaker based in Washington, DC. Since beginning her career in 2011, she had over 40 productions of her written work both in the US and abroad, and is the winner of a StageSceneLA “Best World Premiere Play” for "War Bride" in 2012. Her play "Reset" was a semi-finalist for the Princess Grace Playwriting Award (2015), and her award-winning film "Last Pyramid" (2015) was accepted into several festivals, including the Independent Film Festival Boston, and has helped in the fundraising and awareness raising efforts for the mission of the Epilepsy Foundation. in 2016, Samantha won the Jury Prize for screenwriting at the Northern Virginia Film Festival, where in 2015 "Last Pyramid" won film of the year. This year, she was also the Keenan Lecturer for the UVA Drama Department while her play "The Arctic Circle *and a Recipe for Swedish Pancakes" was in production. Samantha is a graduate of the University of Virginia, and the Playwrights Lab at Hollins University. Deirdre O’Connor is an award-winning playwright and screenwriter. Her plays, includingJailbait and AssistedLiving, have been produced at theaters across the country and internationally. She received Chicago’s 2012 Jeff Award-Non Equity for Outstanding Achievement in New Work. Her work has been published by Dramatists Play Service, Smith and Kraus, and Applause Theatre & Cinema Books. Deirdre has written extensively for television and film earning a Writers Guild Award Nomination for her work on the television movie FIVE and an Emmy Award for The Electric Company on PBS. Deirdre is a graduate of Hampshire College, and Columbia University's MFA Playwriting program. Todd Ristau designed and launched the Playwright’s Lab at Hollins University and has served as program director since its launch in 2007. He is a distinguished graduate of the Iowa Playwright’s Workshop. His work has been performed in theatres across the U.S. and England, including London’s West End. He founded No Shame Theatre in 1986 and oversaw its evolution into a national network of venues for new works in dozens of cities. He has an extensive theatre background, with expertise in acting, directing, and design. He worked with Mill Mountain Theatre for six years as coordinator of their second stage and as literary associate overseeing new works programming. Ristau served as the first artistic director of Studio Roanoke, a storefront theatre space dedicated to new works development in downtown Roanoke. Ristau is a member of the Dramatists Guild and Literary Managers and Dramaturgs of the Americas. He is very active in the South Eastern Theatre Conference and serves as chair of the Getchell New Play Award Committee as well as the SETC Playwriting Interest Committee. He currently serves as KCACTF Region IV’s Chair of the National Playwriting Program. Three original short films premiere Saturday, April 29 at 7pm in the Ruth Caplin Theatre. Rose centers the experience of a young Indian-American women navigating cultural intersections and pitfalls in her daily life. On her quest to find herself, she also finds a best friend. Rose aspires to generate dialogue concerning what it means to be a womxn of color, a womxn of awkwardness, and being a second-generation American. Danica finds herself constantly harassed and surveilled by a pervasive stalker who makes it impossible for her to forget her own insecurities. She realizes, however, that the only way for her to move on with her life is to confront this stalker, which means confronting her own dark thoughts about herself. Stakes have reached a new level and changed irreversibly as “Through Every Open Window” sees the aftermath of Nathan Taylor’s death. But the search for Cassie’s assailant continues, as friends from the periphery emerge to show their strengths and do her justice, in a way that Taylor never could. Now, the threads are closing in on the same name on everyone’s lips: Clint Reardon. The New Works Festival is co-sponsored by the Department of Drama and by an Arts Enhancement Grant from the Office of the Provost and Vice Provost of the Arts.